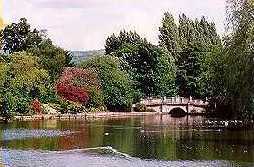 Cheltenham has much to offer visitors with its wide tree lined avenues, fine Regency buildings and beautiful parks. At the northern end of the town you will find Pittville Park which has two scenic lakes, an 18 hole pitch and putt course, tennis courts and spacious lawns featuring colourful flower beds. Also in the park is Pittville Pump Room where the spa waters which made Cheltenham famous can still be tasted - if you are feeling brave! The Pump Room also houses Cheltenham's Gallery of Fashion. 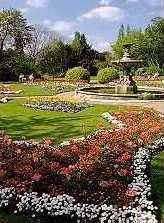 You are never far away from one of Cheltenham's lovely parks where you can sit and admire the floral displays which have helped Cheltenham to win the Britain in Bloom trophy. One of the best hidden but beautiful parks is Sandford Park and adjacent to this is Cheltenham's outdoor heated swimming pool the Lido. Heading back towards the centre of town, your next port of call should be the Holst Birthplace Museum where you can see exhibits belonging to Gustav Holst - best known as composer of the Planets Suite. Right in the centre of town is Cheltenham Art Gallery and Museum which houses a wide range of treasures and regularly holds special exhibitions. Leaving the centre of town via the wide, tree-lined Promenade your journey will take you past the Municipal Offices, the Imperial Gardens where every summer an exhibition of the works of local artists is held, and the impressive Queens Hotel. Carry on past the hotel and you will be in the Montpellier district of the town with yet another park on one side of the road and on the other, a parade of speciality shops. 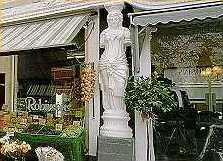 The architecture of this area is extremely interesting and one special feature to look out for is the presence of Caryatids - handsome figures based on the Acropolis - between each shop. There are many other beautiful buildings worth seeing - in fact Cheltenham has over 2,000 listed buildings - and the town's planners have ensured that newly constructed buildings do not disrupt the Regency feel of Cheltenham.